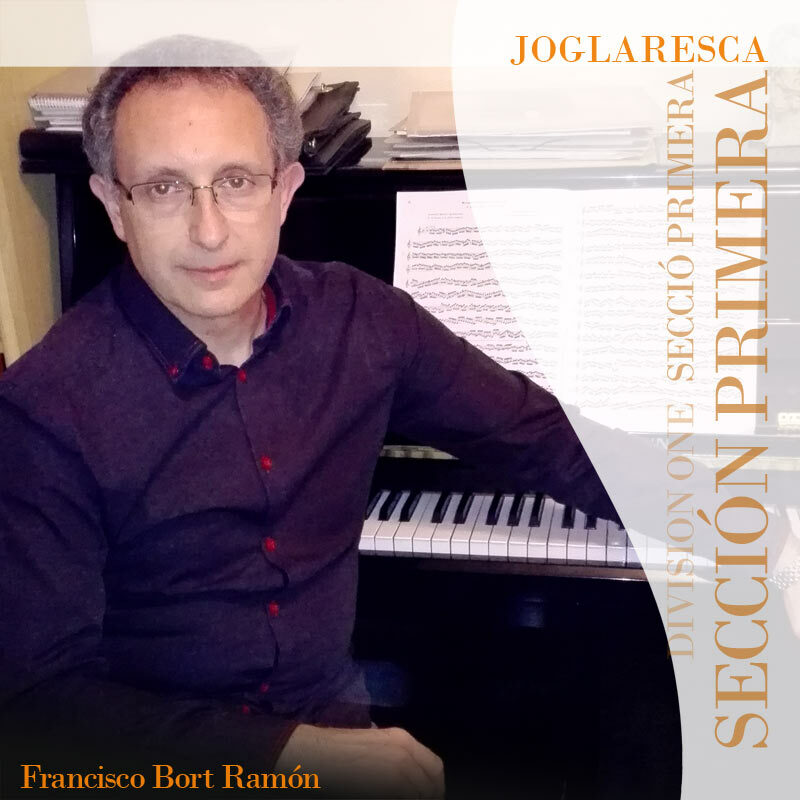 The groups participating in the Section One of the International Music Band Contest “Ciudad de Valencia” 2018 will have to interpret the “Joglaresca” score by composer Francisco Bort Ramón as a mandatory work. A saxophonist and composer, Francisco A. Bort Ramón was born in Catarroja (Valencia) and studied at the Valencia Superior Conservatory of Music. He has been a member of the Valencia Municipal Wind Band since April 1987, a post he gained though public examinations, and is currently the Band’s alto saxophone soloist. He has composed more than twenty works from chamber music to symphonic pieces. He won the 2007 “Maestro Villa” wind band music composition prize in Madrid with his work “Variacions Iròniques”. Some of his symphonic compositions (“Llegendes”, “Ocurrències”, “Variacions Iròniques”, “Divertiment”, “Des de 1903”) have been compulsory pieces in wind band contests such as the Valencia CIBM, the Valencia Provincial Contest and the Vila de Catarroja Contest. As a saxophonist he has premiered his own works, including “Llampecs de tardor” (alto saxophone and wind band), “Poema” and “Ferling a swing” (saxophone quartet), “Joc concertant” (saxophone quartet and wind band) and “Faràndula” (soprano saxophone and wind band), with the collaboration of the Valencia Municipal Wind Band and the “Studel Sax” saxophone quartet of which he is a member. The night is calm; the first rays of the new day begin to appear. The troupe has arrived in the town. Today is market day and there will also be games, songs and dancing. The party is over, the Inquisition has arrived. Celebration in the lord’s castle. Everyone is invited. Into battle with fear and resignation. The work is dedicated to Teresa Marí, the composer’s wife, and was premiered by the Valencia Municipal Wind Band led by their conductor, Fernando Bonete, in the city’s Palau de la Música on 27 May 2012.